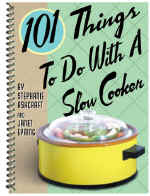 Combine all ingredients in greased 3-1/4 to 5-quart slow cooker. Cover and cook on high heat 4 hours or on low heat 6-8 hours. Serve with baked potatoes and a side of stuffing. *Do not use jellied cranberry sauce as it adds too much liquid.